Apple (AAPL) shares typically rally on earnings surprises and product announcements, but Tuesday we witnessed the power of a single tweet, one capable of moving the $445 billion stock up by as much as $17 billion. 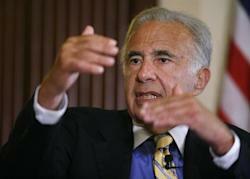 Billionaire investor Carl Icahn, in a tweet posted at 2:21 p.m. ET, said he had bought Apple shares, an announcement that pushed the stock up from $475.76 to a high of $494.66 about an hour later. In total, that was a $17 billion move. "We currently have a large position in APPLE. We believe the company to be extremely undervalued. Spoke to Tim Cook today. More to come," he wrote. Icahn followed up with a second tweet a few minutes later explaining he’d had a "nice conversation" with Apple CEO Tim Cook and hoped the company would increase its stock buyback plan. Apple closed at $489.55, meaning its market capitalization increased $12.5 billion from the time of Icahn’s initial tweet. The shares have been rallying, gaining 15% since the company announced its most recent earnings on July 23. Apple said it sold 31.2 million iPhones, far more than analysts expected. The stock has also benefited from rumors that a new iPhone will be announced on Sept. 10, possibly even a low-priced plastic model to better compete in developing markets. The unprecedented Twitter move came just a day after Icahn’s company warned that the wily and seasoned investor had embraced social media and might use it to disclose important information. "It is possible that the information that Mr. Icahn posts on Twitter (which may include information regarding companies in which we and/or Mr. Icahn have or may be contemplating an investment position) could be deemed to be material information," the company said in a filing. Icahn hasn’t tweeted much -- his most famous previous missive related to his battle to stop Michael Dell from taking Dell (DELL), the company he founded, private. "All would be swell at Dell if Michael and the board bid farewell," he tweeted on July 24. Icahn's history of pushing companies to improve shareholder value could encourage other investors to buy Apple, as well, analysts said. "Icahn's position in, and potential role as an activist in, Apple could have a notable positive impact on the stock," Scott Kessler, an analyst at S&P Capital IQ, said. The Apple tweet also prompted a cascade of comments and jokes from others. "Buy on the rumor, sell on the tweet," quipped Circa editor in chief Anthony De Rosa.